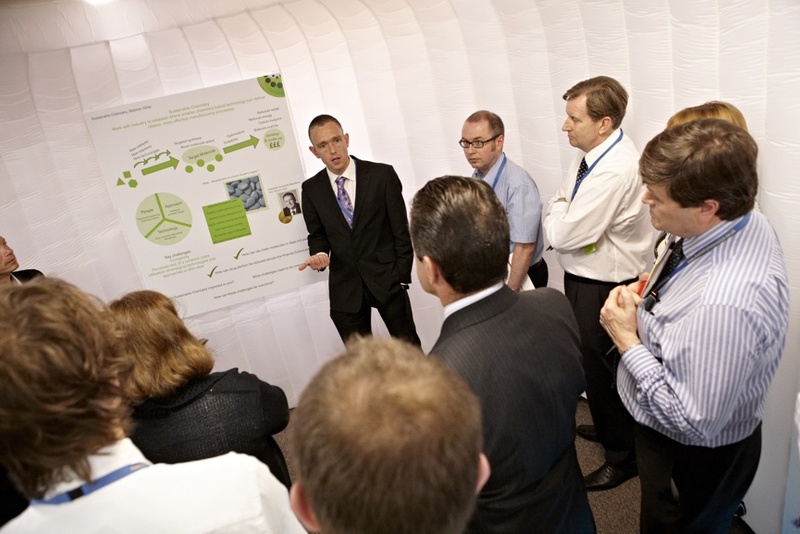 On 2nd & 3rd of June 2011, Chemistry Innovation held its 5th annual Stakeholder Forum at Birmingham, UK. Hosted at Aston Business School in their Lakeside Conference Centre the event was attended by over 100 representatives from across the chemistry-using industries providing an exciting mix of industry, academia and supporting bodies. Carol Boyer-Spooner, CEO, kick-started the event, marking some of the key contributions to Chemistry Innovation’s activity. In his first year as Chair, Graeme Armstrong introduced the event with a focus on delivery and an emphasis on sustainability and collaboration. Graeme highlighted his vision for Chemistry Innovation and the chemistry-using industries as a whole, with expectations now focused on delivery. Dial-a-Molecule has been represented at this event by Prof. Steve Marsden and Dr. Bogdan Ibanescu. The event offered the ideal occasion to inform key members from the chemistry-using industries about the aims and the opportunity that Dial-a-Molecule represents. The audience was informed about the themes and the focus areas as well as about the events and achievements within the network. The ideas collected in different meetings and the ways in which they are applied were presented. They shortly summarised the achievements and provided an update of information about all actions and developments within the Dial-a-Molecule project. The dissemination strategies adopted in order to establish widespread awareness for project activities and to ensure an uptake of the project results have been presented. Discussions were carried out looking for the right principles and methodologies to be used for the future development and success of the network. The participants provided invaluable feedback on the progress of the project as well as an excellent occasion for networking.